At All About Eyes of Sayville, Robert Grasso, OD, and optician Bill Brandwein provide personalized, top quality eye care to the people of Sayville, New York. 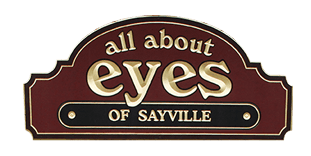 All About Eyes of Sayville combines the services of an optometrist — complete with an on-site lab — with a fully stocked showroom of eyeglasses, contacts, and specialized corrective lenses to give patients the most convenient and comprehensive care possible. Dr. Grasso can provide everything from a simple yearly eye exam to emergency eye injury treatment. He has over 40 years of experience diagnosing and treating eye disorders and injuries. His expertise paired with the resources he has at All About Eyes of Sayville make him an invaluable asset to anyone in Sayville and the surrounding area looking for a path to better vision. For new sunglasses, eyeglass frames, or lenses, look no further than the fully stocked showroom. With competitive prices on everything from budget to designer frames and the help of experienced optician Bill Brandwein, patients can find the exact style they want for their glasses, one that combines style with improved vision and quality of life. If you are interested in an eye exam, new glasses, or any of the other services provided at All About Eyes of Sayville, make an appointment online or by phone today.